A dazzling synth in its own right. Great to work with and a pleasure to drop into any mix. Sounds great. Easy to use. Could be a tad cheaper! Audio Realism's Bass Line has quietly become the industry standard TB-303 emulation over the last few years, offering everything Roland's original classic ever could and then some. Now, with Bass Line Pro, the Swedish company have given their already rockin' synth a massive shot of steroids, beefing it up into a far more versatile semi-modular machine with a supercharged 303 at its heart. An intriguing development in the history of the acid legend - I wonder what Tadao Kikumoto would make of it. To be honest, for the most part, the 303 heritage of ABL Pro (as its creators call it) is relegated to the six-knob panel in the middle and the step sequencer, and even those have been upgraded. The sequencer features virtual CV output, variable gate time and a three-octave keyboard for convenience. While the Envelope Modulation can be shaped via the synth's Main Envelope Generator (MEG), the Decay knob has been traded for a filter tracking control, and the Accent parameter has separate decay and volume controls to the right. It is possible to 'do' traditional 303 business to a certain extent with ABL Pro by just using one oscillator, setting some of the surrounding parameters to specific values (given in the manual and one of the presets) and not straying from the central controls. However, elements of the core engine (the accent circuit and filters, for example) are different to those in the original Bass Line, so Audio Realism make it clear that if you're after a 303 emulation, that's the better option. 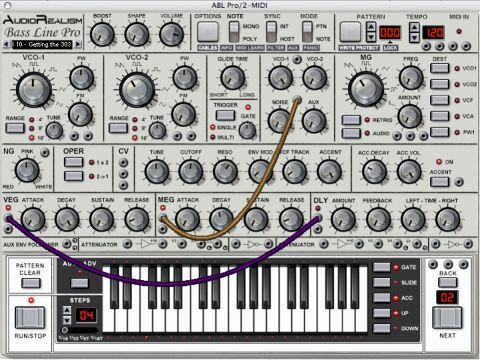 With that out of the way, then, ABL Pro is a two-oscillator, two-envelope, single-filter, single-VCA, single-LFO semi-modular subtractive synth with a graphical CV cable patching system like that in Reason and Arturia's Moog Modular V.
As well as making noise on its own, it can also be used to process external audio signals, and a 2x oversampling filter mode is included for this purpose. The interface looks great, with nifty swinging cables and beautifully rendered knobs, though at times it can feel quite cramped and confusing, with many of the CV sockets bereft of legending and the knobs in the Voltage Processor section being absolutely miniscule. The sockets problem is at least alleviated by the ability to choose sources and destinations by right-clicking on them, but they could do with icons or single character labels at least. The two oscillators are both identical and offer five different waveforms (sawtooth, square wave, pulse, triangle and sine), sync of oscillator 2 to oscillator 1, frequency modulation of oscillator 2 by oscillator 1 and ring modulation. It's also possible to bring a third oscillator into play, as the LFO (or Modulation Generator, as it's been dubbed) can be cranked up into the audible frequency range while still being used to modulate multiple targets. And for added dirt, a noise generator is also built in, which can be set anywhere between red, pink and white noise, that particular control sports a CV input for modulation by all manner of sources. Before the two oscillators reach the mixer, their waveshapes can be touched up with the Shape control, which is also CV modulatable. In the same section, bass boost can be applied to the oscillators and the overall volume can be adjusted. The low-pass filter sports three different settings: 18dB/octave, 24dB/octave and the aforementioned 2x oversampling 24dB/octave. The cutoff can be modulated by the LFO, its own ADSR envelope, and (via CV cabling) note pitch, velocity and anything else with a CV output socket. The pattern sequencer is essentially the same as that in Bass Line, with 1-64 steps per pattern, 128 patterns per patch, host sequencer sync and triplet timing settings. It can, of course, also be turned off by switching ABL Pro to Note mode and playing it with a MIDI keyboard. Where it is different is that it has CV outputs for note pitch, Gate and Accent (the last two acting as high/ low switches), and the very handy Advanced Randomizer. This lets you create random patterns with control over the 'density' of Note, Gate, Slide and Accent events, and the specification of root note, scale and pattern length. When in Pattern mode, MIDI notes are used to switch patterns, and one particularly clever aspect of this is in the way overlapping notes are handled. By holding down one note and then playing another alongside it, the pattern step numbers roll on rather than starting from 1 again, while the pattern itself changes to that dictated by the second (then third, fourth, etc) note. The most important thing with any synth is the sound, and ABL Pro's is big, bouncy, bursting with energy and oozes class. The oscillators are smooth and powerful, the filter could cut through steel and the modulation system enables you to bend the signal into any shape your imagination can come up with. The icing on the cake is the onboard delay unit, with its independent and modulatable L/R delay times. The only snags are the occasional interface complexities and a tendency for some extreme output levels if you're not careful with your patching. But other than that, it's all good, from the design and sound to the vast collection of quality categorised presets, which cover just about every conceivable base before you've even touched the controls. Tadao would surely love it.